HoloToy is an iPhone app that renders predefined 3D environemnts on your screen and responds to the accelerometer to let you view the objects from various angles. The first version of HoloToy ships with six holographic scense, including a Cornell Box, The Impossible Triangle, plus four movable spheres: Earth, Moon, Mars and Jupiter. 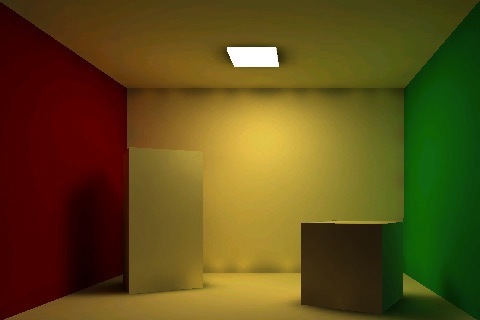 Cornels Box is a room with different colored walls and two boxes on the floor. There is a light source coming from the ceiling as well. The Impossible Triangle is a rendering of such object floating in a room. Finally the 4 spheres are renderings of various stars and planets that you can flick to rotate around. You are supposed to hold the phone at a 45 degree angle to get the initial position of the rendering as it was intended to be viewed. You can rotate the iPhone around to see other views in real time. The graphics are nicely done, and very colorful. There is no sound in the app. Besides the initial excitement over playing with a 3D environment, there is really nothing else to do with this app after a few minutes of use. It would be great if the app allowed users to take photographs of objects and turn them into holograms, which would make it more interesting and personalized. The developer states they might add new holograms to the app in future version which might add value. For now, we don’t think there is enough here to warrant a purchase. AppSafari review of HoloToy was written by Joe Seifi on March 11th, 2010 and categorized under App Store, Fun. Page viewed 5488 times, 1 so far today. Need help on using these apps? Please read the Help Page. 7 days after release the first update is approved by Apple and ready for download. This update brings HoloBot a remote control robot with 29 different skins and the ability to design your own. I will be aiming to release an update every week, the 2nd update is already in development. Thanks for the review.